Photographic identification guide to the 280 bird species most commonly seen in Malaysia (including the states of Sabah and Sarawak on the island of Borneo). High quality photographs from some of Malaysia’s top nature photographers are accompanied by detailed species descriptions which include nomenclature, length, plumage, distribution, habits and habitat. The user-friendly introduction covers climate, vegetation, biogeography, opportunities for naturalists and the main sites for viewing the listed species. Also included is an all-important checklist of all of the birds of Malaysia encompassing, for each species, its common and scientific names as well as Malay names, its status in each state as well as its global status. Dr. Geoffrey Davison has spent all his working life in South-East Asia, as a university lecturer in Malaysia, a conservationist with WWF, and now with the National Parks Board in Singapore. His interests range across ornithology, tropical forest ecology and animal taxonomy. 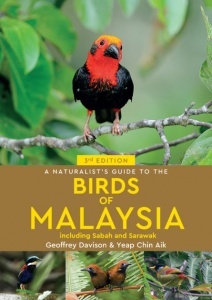 He has written numerous scientific papers, as well as a number of books about birds and wildlife in South-East Asia, including bestsellers Photoguide to the Birds of Borneo and Photoguide to the Birds of Peninsular Malaysia. Yeap Chin Aik began birdwatching in his early teens and is currently Head of the Conservation Division at the Malaysian Nature Society (MNS). He has written several scientific papers, and is one of the main compilers of Important Bird Areas in Malaysia: Key Sites for Conservation.